The old standby cotton T-shirt doesn’t have much of a place in the outdoors. Even beyond the “cotton kills” adage, the average cotton shirt is clammy, heavy and generally not terribly comfortable for athletes. Fortunately, there’s a whole crop of synthetic-fabric T-shirts made with the outdoor athlete in mind. Polyester, nylon mesh, Lycra and other materials stretch, breathe, dry quickly and stand up to abuse. Here are a few of my favorite new models. Of all the shirts I’ve tested this year, the Hydrid gets my No. 1 vote. The polyester fabric wicks well, the shirt is comfortable and light, and Duofold includes a zip on front to open the shirt up for added ventilation. It’s also among the least expensive in this batch. This three-button shirt will stand up to business-casual dress codes in corporate America and hold its own wicking a sweaty body in the woods. Ex Officio uses a mix of 85 percent polyester and 15 percent cotton to create a breathable and soft-feeling shirt that’s quick drying and resistant to wrinkles. My favorite for looks, the stylish Axis Tech also breaths well and is comfortable for moderate workouts. Its mid-weight polyester fabric gives the shirt a more substantial feel than most other synthetic T-shirts I tried. To make you visible at night, the Adventure T-shirt has a reflective coating on the surface of the fabric. 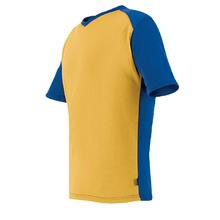 The shirt also offers UV protection at UPF 30+ levels, according to the company. I found this lightweight shirt to be highly breathable and friendly to any kind of vigorous aerobic activity. It looks and feels pretty much like a cotton T-shirt, but the Day Tripper is made of a lightweight synthetic mesh fabric that pulls sweat off skin so well White Sierra says you can use the shirt as a base layer in colder weather. The company designed this shirt without a shoulder seam so it’s comfortable to wear under a heavy backpack.